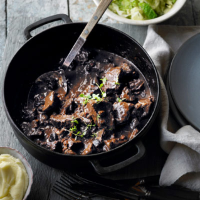 "Good quality chocolate gives great depth of flavour to this rich stew. Serve with polenta or mash to soak up the delicious juices." 1. Preheat the oven to 170˚C, gas mark 3. Cut the beef into large pieces, about 5cm wide. Sprinkle the flour on a plate and add a little seasoning. Toss the beef in the flour to lightly dust. 2. Heat 2 tbsp of the oil in a large frying pan and fry the meat in batches until thoroughly browned, transferring each batch to a casserole dish. Heat the remaining oil in the frying pan and add the bacon and onions. Fry gently for 5 minutes to soften, adding the garlic towards the end of cooking. 3. Using a small sharp knife, pare several thin strips of zest from the orange and add to the frying pan with the thyme, wine, stock and cloves. Bring to the boil and pour over the meat. Cover with a lid and cook in the oven for 1¼–1½ hours or until tender. 4. Use a knife to shave the chocolate off the block, or grate it if it's easier. Add the chocolate to the casserole with the olives and cook for a further 10 minutes. Leave to stand for 10 minutes before serving.